As I sit here today thinking of ways to bring more systems to the people of our local community and to involve the members of our community I can't help but show you what Will Allen of Growing Power Inc. has done in Milwaukee. 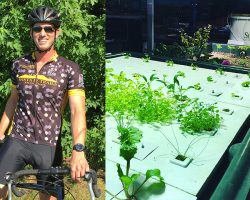 Through Aquaponics and other sustainable farming techniques he has inspired a food movement throughout his community. His workshops have also inspired other urban farmers and community leaders such as Dre Taylor of Nile Valley Aquaponics in Kansas City, Missouri who has a goal to grow 100,000 lbs of sustainable food for his community and teach members of his community the essential life skill of being able to grow your own food. Too often in todays society we forget what's important in life, our fellow man. By taking just a few minutes out of your busy schedule everyone is able to reach a hand out and provide some sort of helping hand. I am definitely not promoting free hand outs. What I am saying is teach someone something that is useful everyday. It is our job to ensure future generations are equipped to not only survive but to thrive.